Users want it. Marketers want to offer it. Bots are here to serve it. Pointing and clicking; scrolling and pressing. We don’t think about the graphic user interface, because that is how we are used to interacting with technology and devices. But of course, this didn't come about by chance - it’s the product of evolution from a predominantly text-based interface. Text-based input can be very powerful, and it can be much quicker to carry out certain functions with text commands rather than navigating through graphic-based menus and options. The problem is that these commands must adhere to a certain syntax. Now, however, technology is learning to speak our language - say hello to chatbots (literally - they'll understand you). Whether or not apps are “dying” is debatable, but the fact is that there is definitely a shift; 77 percent of users never use an app again 72 hours after installing it. It must be noted that some apps are very use-specific and serve a function that may only be needed once in a while, so this statistic isn’t necessarily testament to the failing quality of apps. However, for companies looking to utilize apps for their marketing efforts, the implication is the same - people don't stick around. Are chatbots the answer? Let's take a look. 1: Chat is popular. Really popular. The boom in chat usage coupled with an increase in consumer “response entitlement” means that users will turn more toward chat as a means of seeking information and support. The very nature of chat is instantaneous communication, so users are starting to expect instant answers from companies, just as they get instant answers from their contacts. 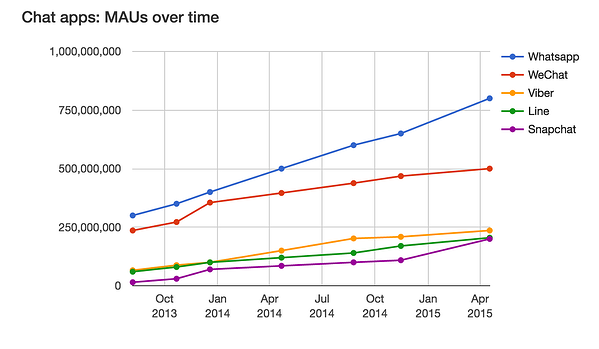 From here we can see that last year, the top two chat apps had a combined user base of around 1,3 billion. Not only that, but messaging apps now have more active users than social media, so it's vital that companies spend some of their marketing efforts toward building and maintaining a presence on the chat platform. For marketers, the key difference of chat from other channels is that any communication is initiated by the user. Sending out a marketing email to thousands of people is a wide net to cast, one that may bring in very few fish. For those customers who aren't interested, these emails can become annoying and can result in a negative impact on the brand's image. Bot's, however, are approached by the customers who are actively seeking that interaction. Users can find and connect with a brand's bot just as they would a new friend, by searching for their name and just start chatting. Users can also browse available bots on "bot stores" which have been added on Kik and Messenger. 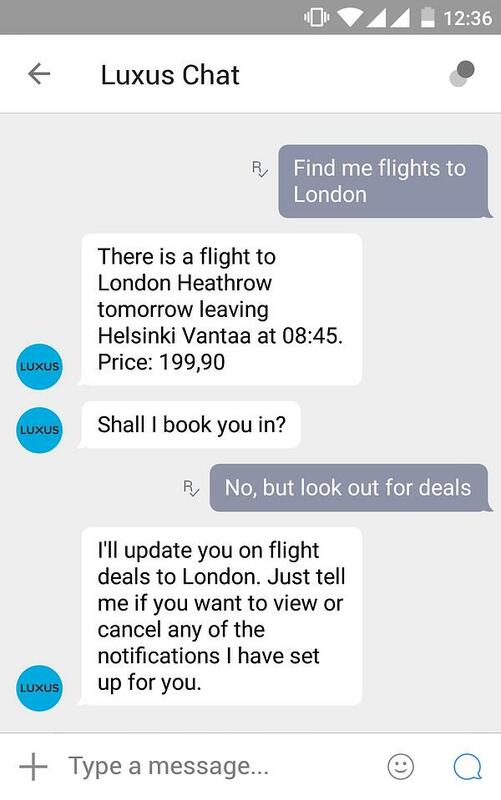 An example of how chatbots could help the user find products and services. 2: It's what everyone wants. 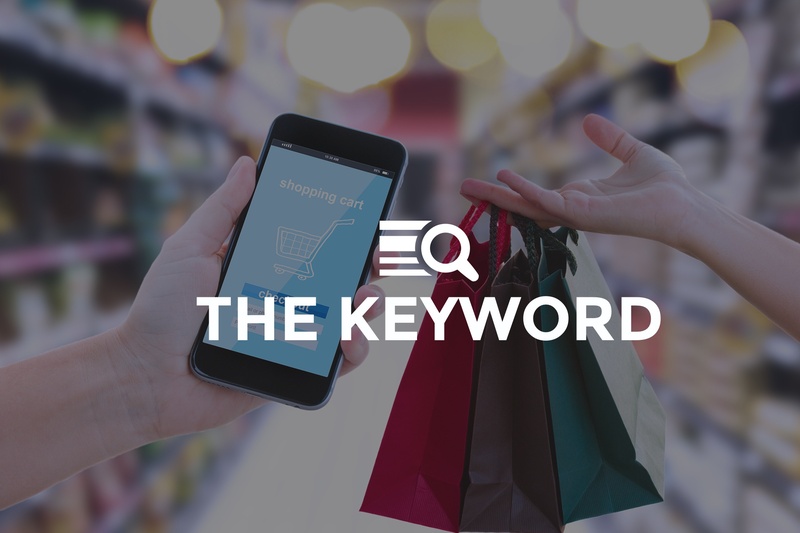 With apps falling in popularity, users and marketers are actually looking for the same thing - a single platform that can perform a number of functions that can be leveraged for almost any type of marketing campaign. There is still room for improving the competence of today's bots, but they still serve as a very unique form of brand and consumer interaction. Users can get the information they want on products and services instantly while the marketers collect accurate data, which goes on to improve their services. In turn, this could improve the bot's ability to serve the specific user. The ball keeps rolling, and everyone wins. Services, events and products can be found on social media. In fact, look at some marketing material for these and you'll probably see the familiar row of SoMe icons in the corner somewhere: the "F", the little bird, the camera... Imagine the likes of WhatsApp, Messenger and Kik being added to, or even replacing this list of usual suspects. Perhaps one unifying symbol will come to represent the whole chat platform. Of course, that means your bot will have to be available on all of the chat apps, right? Possibly - but it's not as daunting as you think. 3: It's actually pretty simple. Chat apps already have a UI in place one which provides and streamlined user experience that users are familiar with. Making a bot for these apps means that you are left to focus on designing the conversations without having to worry about the interface itself. While the marketer should decide on the bot's overall "personality", there is a great opportunity to engage with the user on a personal level. For example, if a user asks a bot outlandish questions, there is a chance that the user is looking for some banter. If the user is looking for a product and asks in a straight-forward manner, they probably just want the job done, so then isn't necessarily the time for humor. In terms of content, the process of making the same information on a website available to a bot isn't particularly difficult for those who know what they're doing (like us, for instance). Then, once a bot is made, it's trivial to make it available on existing platforms, so whichever chat app your potential customers have chosen, they are within reach of your bot. Because you won't have to build the bot from the ground upwards for every different chat app, marketers can use a bot to easily target huge audiences. 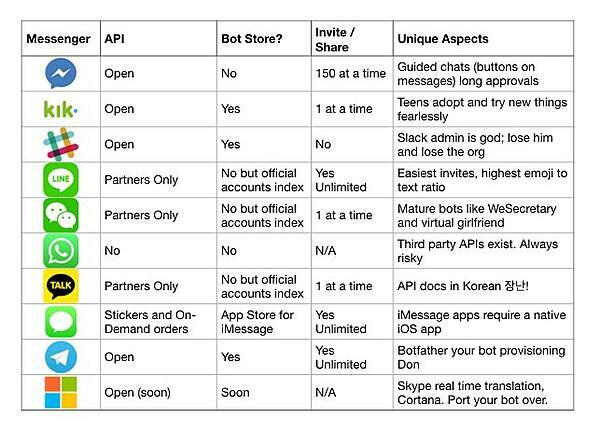 Check out this chart from a few months ago which shows which chat app supports what. Having ads appear on a chat service is a bad idea – it would put users off, and at this crucial point for chat as a platform, pushing users to other services could be disastrous. Bots are a far more appealing means of marketing; they are unobtrusive and engaging. Plus, bots still have the added element of being something new, so marketers who can get in on it at this early stage will likely attract users through curiosity of the bot itself, perhaps more so than interest in the actual product. Wondering what a bot could do for your business? Chatbots Magazine: So you want to build a chatbot?